Singer-songwriter Will Hoge's My American Dream is a timely protest album with the 2018 mid-terms in view by confronting mass shootings, gun control, and politics of modern American society. The direction Will Hoge takes on his new album My American Dream was first teased with the single "Thoughts & Prayers" in November 2017. Released in the aftermath of the Sutherland Springs and Las Vegas mass shootings, it was a definitively political anthem against the NRA and inaction on gun control. The song was an admitted method of Hoge working out his frustrations about a number of issues in recent years: "Border police. Political corruption. Anti-intellectualism. Poverty. Gun control. A broken education system. Indifference to others' suffering." My American Dream is inspirational in its delivery and direction as Hoge holds nothing back with powerful songwriting full of care, conviction, and anger. The album was conceived during touring in support of Hoge's last album, Anchors, released in August 2017, and written and recorded in a fury as mass shooting tragedies occurred in the months that followed. From "Thoughts & Prayers" Hoge goes further to criticize President Trump and inaction on school shootings on "Gilded Walls" and document his confrontation over the meanings of the Confederate flag as a child and modern Southerner on "Still a Southern Man". These tracks tackle those issues head-on and highlight the images and hypocrisies Hoge witnessed on tour and thinking about his children. The personal aspects and anger on display further demands a different approach for popular music and undoing any stigma or fear associated with overt political statements, such as any position on the NRA, politics, and government, and the South – particularly in modern country music. The opening track "Gilded Walls" admits Hoge's political leanings immediately and without regret. A sharp attack on President Trump and the policies and actions of his administration and events in recent years, Hoge notes a disconnection between issues like the water situation in Flint, Michigan, and living a sheltered life with an inheritance. Or a school shooting addressed by a tweet. With such a strong opening, Hoge risks turning conservative listeners or anyone uninterested in political songs away from this album and his songwriting. But, that's a risk answered by the quality of his songwriting and the performances, and listeners unwilling to face the issues Hoge explores are not the audience he seeks. Hoge's songwriting on My American Dream also excels when he tells stories within the political commentary, such as on the title track and "The Illegal Line". Both tracks reveal the efforts to find home and work in the 21st century, and the title track recounts a character returning home to care for his family when they can't make ends meet, giving up expectations of college, career, and economic success for individual Americans in the face of struggling to survive. "My American Dream" additionally reveals how political promises and claims often result in little effect, as the singer returns to a town he doesn't recognize despite prospects the community sought to achieve. Immigration and the Border Patrol are addressed with a heavy tale on "The Illegal Line." It is a direct approach that attacks efforts by the Border Patrol and fits timely with the developments of the last six months as families are separated, and the current administration seems fine taking those actions without regard. Promoting My American Dream, Hoge admitted the album reflected his concerns not simply as a musician or songwriter, but additionally as a father with children whose future is shaped by the events he addresses in song. ThisThat is a personal touch that affects heavily, and the audience is meant to be his sons and his own mindset. "Still a Southerner" explores Hoge's childhood spent idealizing Southern attributes like the Confederate flag, with a revelation that the consequences of celebrating that flag and the South it represents are complex and problematic. His "Southern man" rejects those details that limit and impede the rights and abilities of any other person or group. Hoge's biographical song calls his realization a truth in the face of unashamed behaviors, and he leaves the track ready to "tear [the flag] down" even though he's "still a Southern man". 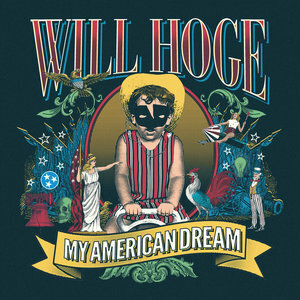 At just under 29 minutes, Will Hoge's My American Dream is quick and entertaining. Never light in ideas or limited in the discussions it includes, the album ends with "Nikki's a Republican Now", a fast-paced song that traces a political shift of a girl from liberal and progressive in high school to conservative and Republican when her parents disagree with her behavior, attitude, and an unwanted pregnancy. The song is a sly wink to those Americans that reject any efforts to confront modern issues and topics and counter with phrases like "All Lives Matter" while carrying an AR-15, and illustrates the cruel reality faced by the outrage expressed and disagreements intended by the previous seven tracks. Hoge presents an entertaining and thought-provoking protest album with emotional storytelling and important messages.